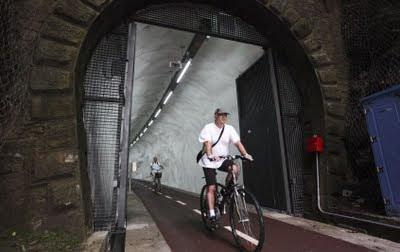 The Basque city of San Sebastian inaugurated the world's longest bicycle commuter tunnel yesterday [07 August 2009] in a former railway tunnel on the Bilbao-San Sebastian route. The Mayor of San Sebastian, Odon Elorza, and the Deputy Minister of Transport of the Basque Government, Ernesto Gasco opened the tunnel to the delight of the many cyclists in the city. The tunnel is aimed primarily at bicycle commuters but recreational cyclists are expected to use it on the weekends as well. Elorza expressed satisfaction at the launching of this new infrastructure that improves the network of bicycle lanes in San Sebastian and is "a symbol of progress, sustainability and personal health". 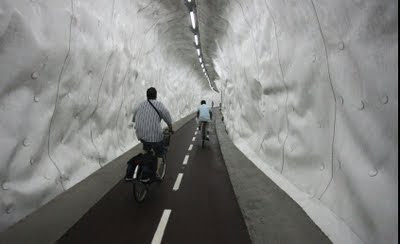 The bicycle tunnel itself is 850 metres long and a part of a 2 kilometre section of former railway that connects two neighbourhoods in the city and is part of the ongoing commitment of the city to encourage people to choose the bicycle as transport. The project cost €2.6 million [$3.7 million] and it is hoped that it will boost the further development of dedicated bicycle infrastructure in the Guipuzcoa Province. San Sebastian is the second-largest city in the Basque region with roughly 180,000 people and 405,000 in the metro area. Amazing that a city of this size is willing to invest in such remarkable bicycle projects when larger cities elsewhere have trouble painting bicycle lanes. Spain has hardly enjoyed status as a bicycle-friendly country in the past. It's a car-centric nation and Spaniards only ride 27 km a year per capita, compared with roughly 1000 km in Denmark and the Netherlands. It looks like things are changing for the better. Here's a list of countries will how many kilometres they ride. 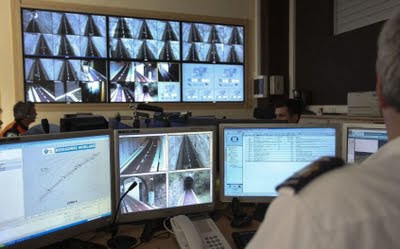 The tunnel features 29 security cameras, a public adress system and closed circuit camera link for the Municipal Guard. It will be closed at night between 23:00 and 07:00. You can see a TV reportage about the new tunnel over at Diario Vasco. It's in Spanish but there is some great footage of the tunnel as well as the many cyclists in San Sebastian. San Sebastian is just one of scores of cities in Europe who are working hard to improve the conditions for their cycling citizens but one that is often overlooked in a global perspective, much like cities like Toulouse. I wanted to share with you the news of the inauguration of this tunnel in San Sebastian, Basque country. It is 2 km long and it connects two neighborhoods of the city. Here in the Basque country, we are trying to be the Copenhagen of the Iberian Peninsula!! You're well on your way, Gorka. Nice one. 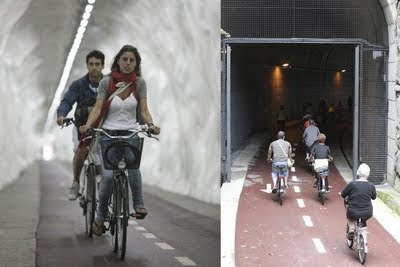 This isn't the first time we've posted about bicycle tunnels. There are various tunnels on the drawing board around the world. This is, however, the first large one that is completed. Here's a post about tunnel proposals in Copenhagen and Qatar. Here's one about a tunnel in Norway. Addendum: Paddy just told us about plans for a 1700 metre long tunnel in Bath, UK.